As part of my awesome partnership with Sprint, I was sent the Samsung Galaxy S5 Sport to review. This phone is aimed at people who love living an active life. It is dirt and water resistant. It has something called Sprint Fit Live which is an app that records fitness and activity from different apps including MapMyFitness and shows it in an easy to find place. I really thought that this was neat because I take my phone for my daily exercise every single day. Each morning when I wake up, I take my trusty 10 lb dachshund with me on a walk (the other dachshund goes straight back to bed after eating her breakfast). He has kept me accountable to walk daily during my pregnancy. We go 1-2 miles usually around my neighborhood. While I walk, I check my email, Facebook and read blog posts. I also sometimes check the weather, Instagram, etc. I almost always track my fitness just to help keep myself accountable for this Sprint Fit Live is very beneficial to me. I like to know how many miles I have done in a month, speed, etc. This phone is great to take during a workout. After I have the baby, I may begin some running again and this would be a very helpful phone to take with me. I love to know my speed during running because it helps to motivate me to run faster. I also love biking so I will take the phone for that as well. I have made the mistake of dropping my phones way too many times so this being dirt and water resistant is very helpful. 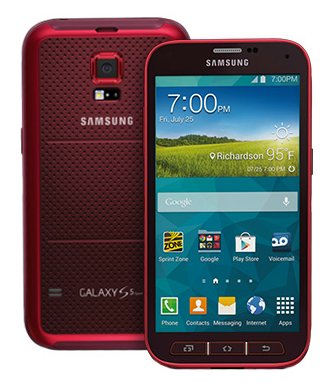 The Samsumg Galaxy S5 Sport gives you up to 19 hours of talk time and has a 5.1" display. The phone is pretty light at 5.6 oz. 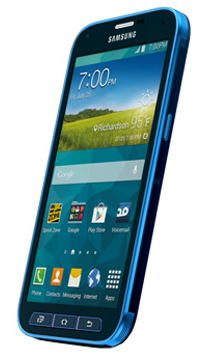 The phone comes in electric blue as seen above and cherry red. I am not really a fan of having a blue phone so I would get a case for it. The phone is brand new and was just released July 25th. It has S Health which is a mobile health platform to access health info, make healthier eating choices and map our your workouts. As a dietitian, I love this because we all could use all of the help we can get. It also monitors your heart rate before and after activity! I had never heard of a phone doing this. The phone comes with a preloaded Activity Zone app with a barometer, compass, flashlight and stopwatch right on one screen. It has a textured outside which makes it easier to hold while on the go. I really like this because it is definitely easy to drop while exercising. You can also have Spotify workout playlists ready to go and integrate them into your workout. When you join the Sprint Framily plan, you get 3 months of Spotify premium for free. This new phone runs on the Sprint Spark network which enhances the service allowing for high quality video. This is a neat phone that is great for people on the go who are interested in health and fitness. I enjoy your cell review posts. I need a new one and a health/fitness feature would be awesome.